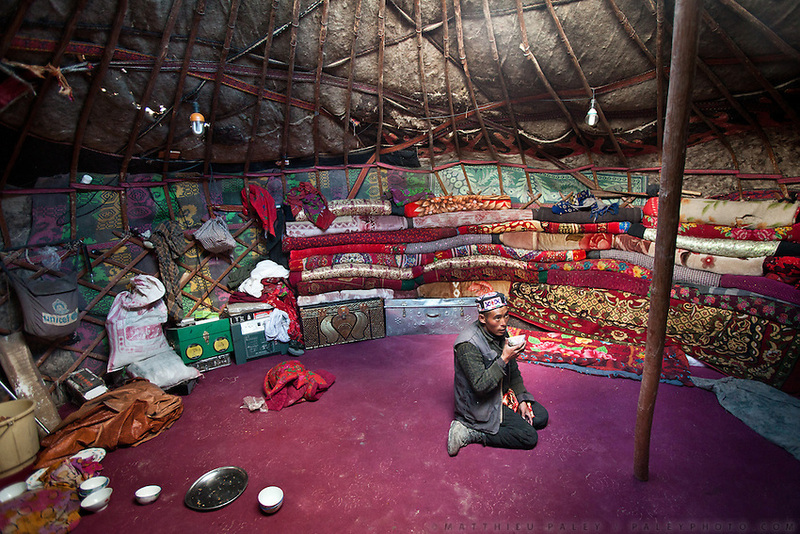 The interior of a yurt with a man drinking tea..Blankets filled with yak and sheep wool pile up against the inside wall of the yurt to insulate it from the constant winds. The floor carpet - bartered against 2 sheep - was acquired by Toorsoon in the lower valleys of Pakistan, a 10 days round trip leading over a 5000m pass. The wooden poles - over hundred years old - are handed over, generation after generation...At the Kyrgyz settlement of Bozoi Gumbaz, before Chaqmaqtin lake, Amon Boi's camp...Trekking through the high altitude plateau of the Little Pamir mountains (average 4200 meters) , where the Afghan Kyrgyz community live all year, on the borders of China, Tajikistan and Pakistan.